A cruise aboard the 5-star luxury ship m/s Paul Gauguin reveals the unparalleled wonders of Tahiti, Fiji and the South Pacific on 7- to 14-night voyages. Experience a more intimate voyage aboard a small ship designed to provide unmatched, up-close views of these most beautiful islands. Discover the exceptional service, elegant fine dining, complimentary watersports and enriching activities that are part of every sailing. Les Gauguines and Les Gauguins, a troupe of Polynesian hosts, accompany every sailing, bringing Polynesian culture to life on board. And through a new partnership with the Wildlife Conservation Society, learn about marine wildlife and their habitats from some of the world’s most interesting scientists, oceanographers and conservationists during your cruise. 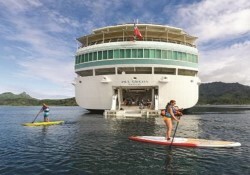 Limited-Time Paul Gauguin Cruises Onboard Credit Offers! New bookings only. Based on availability. Terms and conditions apply. 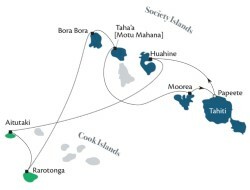 Book a 2019 Paul Gauguin Cruise to the South Pacific Today! 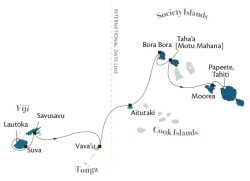 The perfect introductory cruise to the charms of the South Pacific! Explore the incredible diversity of these island landscapes! 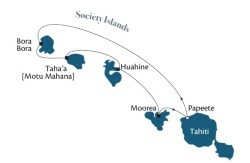 Call on ports in four very different South Seas archipelagos! Tuamotus beckons with an underwater ecosystem known around the world! Call 855.645.2215 to Book Your Paul Gauguin Cruise Today! *PAUL GAUGUIN CRUISES ONBOARD CREDIT OFFERS TERMS & CONDITIONS: Bluegreen Travel Services Amenity OBC Offer – Book any sailing from November 11-30, 2018, and receive $100 shipboard credit per person, up to a maximum of $200 per stateroom. Offer is combinable with Travel Leaders OBC offer or one other SBC offer. Travel Leaders Onboard Credit Offer – Book any 2018 or 2019 sailing from October 2-December 31, 2018, and receive $150 shipboard credit per person, up to a maximum of $300 per stateroom. Use promo code TRAVELLEADERS150. Offer is combinable with Bluegreen Travel Services Amenity OBC offer or one other SBC offer. Neither offer is combinable with Paul Gauguin Two-Week Sale offer. No cash value for unused shipboard credits. Other terms and conditions may apply. The cruise fares shown are in U.S. dollars and are per person, double occupancy, are for new bookings only, are subject to availability, may not be combinable with other offers, are capacity controlled and may be withdrawn at any time without prior notice. International airfare from Los Angeles is included in the cruise fare. Air transportation is for economy/coach or similar class of service on scheduled or charter services of IATA, U.S. or international air carriers. Designated air departure or return cities are at the discretion of PGC and are subject to change without notice. PGC reserves the right to choose the air carrier, routing and scheduling to and from each city and the right to substitute charter flights for scheduled air and vice versa. Service is subject to availability. Terms and conditions apply. See complete Terms & Conditions. Price is per-person based on double occupancy, cruise only for select sailing date and stateroom category, and includes port charges. Government taxes and fees are additional. Prices, additional fees, itineraries, and availability are subject to change without notice. Fares shown are in U.S. dollars for new reservations only and are subject to availability. Deposit of $250 due at time of booking. Please call us at 800.459.1597 for more information. Onboard service charges are additional, may be automatically added to your onboard account, and are subject to your discretion. Certain terms, conditions and restrictions may apply. This offer may not be combined with any other offer/promotion and may be withdrawn at any time. Not included: air transportation, airport transfers, car rental, and items of a personal nature, restaurant fees, some beverages, photographs. Great Vacation Destinations, Inc., doing business as Bluegreen Travel Services, is located at 12400 S. International Drive, Orlando, FL 32821. Great Vacation Destinations is a registered Florida Seller of Travel, license no. ST36225, a California Seller of Travel, Reg. No. 2083124-50 (Registration as a seller of travel does not constitute approval by the State of California), and Washington Seller of Travel, Reg. No. 602511860; and registered with the Airlines Reporting Corporation (“ARC”) number 15-72225-4. Void where prohibited by law and where registration and/or licensing requirements have not been met. In the event of a conflict between Paul Gauguin Cruises’ Details of Participation and Great Vacation Destinations’ Details of Participation, Paul Gauguin Cruises’ Details of Participation shall govern.